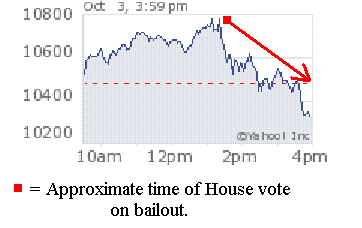 The House passed the Senate version of the bailout this afternoon, and guess what? The stock market dropped. When the bill was being voted on, the Dow Jones was up about 300 points. It closed down 157 today. All the Oklahoma delegation except Frank Lucas voted for the bill. The final tally was 263-171. Well, today the Dow has dropped over 800 points and no one seems to know what to do. It's beginning to be understood that the bailout isn't going to be a quick fix, even though it was sold to the American people as a "have to do it now" fix.